Speaking of Sinatra, ol' Frank had a big hit with the song, "My Kind of Town (Chicago Is)", from the movie, "Robin and the 7 Hoods" back in the early 60's, that portrayed rival mobsters competing for gambling territory. Well, that era of Chicago gangsters was also celebrated in the more recent vintage musical, "Chicago", except that this show exposed the female of the species to be equally as murderous, albeit with a very dark humour to the whole proceedings. Anyway, when they made the film version of "Chicago" just a few years ago, I loved it so much that I think I ended up seeing it about 5 times during its theatrical run. And I've watched it several times since, once it was released on DVD. Because I enjoyed the film so much, I ended up using it as the inspiration for my Christmas card that year, a practice that I'd been keeping up for over 15 years, though I must shamefully confess I have been remiss in doing one both this year and last, sad to say. (Sorry to everybody on the list - hopefully next year I'll get back to it!) Anyway, here is the Christmas card artwork I did that year of "Chicago", featuring caricatures of its stars, Catherine Zeta-Jones as Velma Kelly, and Renée Zellweger as Roxie Hart. Hey, just gazing at Catherine in her black negligee, stockings and garters certainly says "Joy of the Season" to me! Yes, Francis Albert Sinatra was born on this day back in 1915. Don't worry folks, Frank's not winding up to slug ya'. He's just about to roll that lucky seven as he sings, "Luck Be A Lady Tonight". At least that's the song he was singing on the "Sinatra- A Man and His Music - Part II" DVD when I was sketching out this particular pose. Lucky for me, Frank's career is very well represented on DVD, both in his films and, in this particular case, his numerous televised specials from the 60's and 70's. 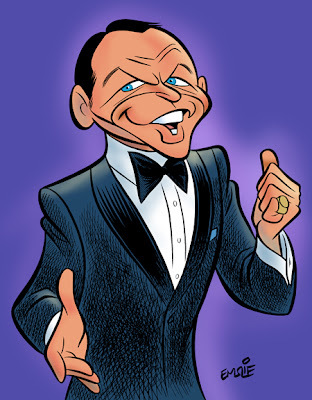 And this is just great with me, as I am a HUGE Sinatra fan! 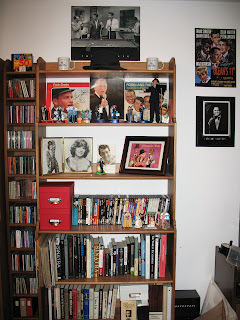 So much so, that I have amassed a fair amount of Sinatra collectibles over the years, many of which can be seen on these display shelves in my own little bachelor den pictured to the left. In addition to the many DVDs, CDs and publications, I've got several original autographs, including the really neat one on the record seen on the top left in the photo, that has some odd little doodle under his signature that I'm thinking may be a quick self caricature. So why my interest in all things Frank? It started when I was in my twenties, adjusting to early adulthood. 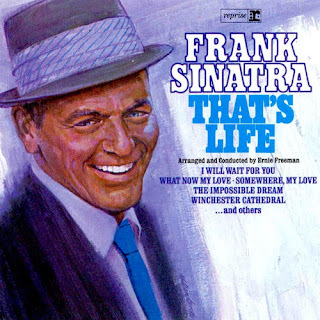 Just as Walt Disney (whose own birthday was coincidentally just one week ago) had been such a major figure in shaping my youth and future career pursuits, it was the music of Sinatra that started to really resonate with me as I was beginning to mature. I'd always casually enjoyed hearing him on radio growing up as a kid in the 60's, but now the lyrics and their heartfelt delivery was starting to really mean something in my own life, leading me to more seriously take notice of Frank's artistry. Though certainly a very controversial and complex man, prone to both petty nastiness and immense generosity, what shines through it all is the intense passion and emotion he displays in every song he sings. Sometimes he's the breezy hipster, joyfully swinging through life to the Billy May and Nelson Riddle arrangements that defined much of his 50's output, while at other times he's the guy nursing a broken heart, exposing his hurt and loneliness for all the world to see. Uncannily, even in the various concert footage preserved on video from his TV specials, Sinatra completely immerses himself in the lyrics and emotions of these songs every time, as if he was feeling each of those raw emotions spontaneously for the first time. It never seemed fake, no matter how often he'd performed them - his passion in delivering the lyrics was so genuinely heartfelt. Listening to his "One For My Baby" never fails to elicit an emotional response - it's that powerful a performance. Likewise, as I myself am approaching the age of 50, I take more and more comfort in hearing his bittersweet rendition of "It Was a Very Good Year". One thing I've always admired about Sinatra was his respect for all the talented songwriters who provided him with his numerous hits through the decades. It was quite normal for him to introduce a song he was about to sing by first crediting the songwriter responsible. He also did the same thing for his regular arrangers. Despite whatever ego Frank likely had as a top entertainer, I believe that deep down he knew that, if not for the songwriters, he would not have been able to enjoy such a long successful career himself. Frank took his music so seriously that he pretty much micro-managed every recording session for his albums, in which he insisted on singing directly with the musicians, as opposed to many other artists who normally came into the studio to lay down their vocals on top of the prerecorded instrumental tracks. For Frank, the music and the words had to be a unified performance to keep it sincere. As an actor, though, Frank Sinatra's film career is, even by his own admission, rather spotty. After an early career in lightweight MGM musicals, Frank had to fight for the role of Maggio in "From Here to Eternity", to prove his real worth as a serious actor and ended up winning himself an Oscar in the process. Unfortunately, his success in movies was pretty up and down in the years thereafter. I must admit, my favourite Sinatra films are mostly guilty pleasures rather than those that are considered his major achievements by serious film critics. Though I can appreciate his sheer skill in a film like "The Man With the Golden Arm", where he played a card dealer addicted to heroin, I confess I'd rather watch him in far breezier roles in "Pal Joey" or my alltime favourite, "Robin and the 7 Hoods", where he starred alongside his fellow Rat Pack cronies, Dean and Sammy. 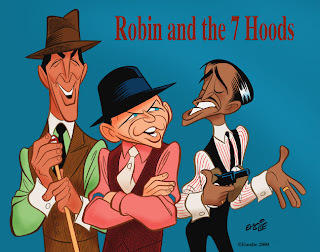 I like "Ocean's 11" a lot too, but I prefer "Robin and the 7 Hoods" because it's the only Rat Pack movie that's an all out musical. Also it's got Bing Crosby in it, so that's a bonus! Ironically, though, I think the standout performer in that film may be Peter Falk as the nefarious Guy Gisbourne, the rival Chicago mobster trying to eliminate Sinatra's Robbo. Falk is just hilarious in the role, many years before he gained greater fame as TV's "Columbo". On this day, December 5th in 1901, Walt Disney was born. Though he may not have invented film animation, Walt Disney, more than anyone else, took it from being a mere novelty to an artform of the highest level, as well as a major American popular entertainment medium. I'm not going to attempt any history here on either the man or his legacy, as you'll find much more authoritative assessments by the likes of Mike Barrier, Leonard Maltin and John Canemaker, but I do want to offer up this one thought. Walt Disney has been called a "genius" by many and I am not going to dispute that in the least. However, I've always felt that much of that genius was due to Walt's basic common sense and good judgment. 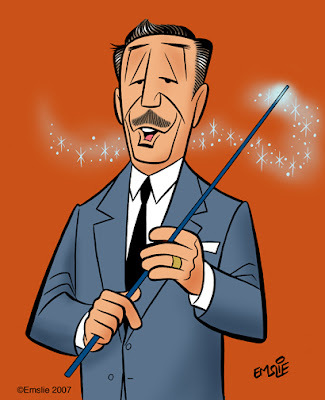 I am certain that the main thing that directed Walt was his own personal taste in art and entertainment. He likely believed that anything he enjoyed and found appealing would likewise be enjoyed by many other people the world over. I doubt that he spent much time trying to second guess the viewing public or by conducting demographic studies, as so many of today's studio brass do. As such, all of the films that were produced by his studio during his lifetime seem to convey much of what Walt personally believed in. I don't think we see that kind of personal sensibility at work very often in today's films. On a personal note, I must credit Walt Disney and his filmed animation legacy with being the catalyst that started me on the straight and narrow path to my own career as a cartoonist. 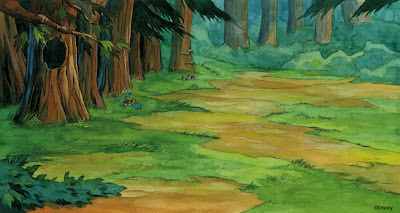 Though I have many artistic influences, it is the Disney classic animated features that remain my first love. Though the stories are always well crafted, for me it is the sense of characterization that I associate with the classics that I most respond to on an emotional level. 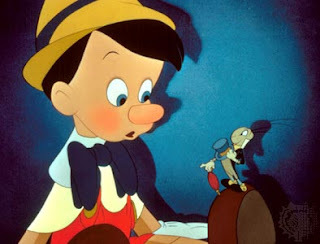 There is still nothing more magical to me than a cartoon drawing that seemingly comes alive up on the silver screen. This thrill has never waned in a lifetime of viewing the work of Walt's talented animation staff. My favourites include "Pinocchio", "Fantasia", and of course the film I recently wrote about, "The Jungle Book", which was the last film to bear Walt's personal stamp. Sorry that's it's been awhile since my last blog entry. My excuse is a combination of being otherwise occupied with job-related stuff, along with lacking the inspiration of knowing what to post. Anyway, the latter problem was cured when I read this article on Jeremy Richey's blog, "Moon in the Gutter", about Kim Novak. As it turns out, Jeremy also lists Kim Novak among his alltime favourite actresses, as do I. So after reading his tribute the other day, I decided to watch the film "Bell, Book and Candle" again last night, so I could sketch a caricature of her. After I inked it up today and coloured it on Photoshop, I went back to Jeremy's blog again, only to find out that he's actually showcased this very film role as a follow-up to what he wrote the other day! Here is the link to his fine article on this film. Jeremy Richey is a far more articulate film commentator than I, so there's not much point in my adding much to it. All I know is that Kim Novak is absolutely sultry and alluring in her role as Gillian, the gentle witch in the story. Since having first seen the film when I was a kid, I can appreciate it even more today for what I perceive as being a sly satire on America's fear and distrust of the communist movement, as typified by the "beatnik" characters who make up the coven of witches in late 1950's New York. Also, since we're at about the halfway point between Halloween and Christmas, this film seems to straddle that interim period quite nicely, being about witches during the Christmas season in Manhattan. I've long admired Kim Novak's good looks, as, like her contemporary, Marilyn Monroe, she's quite representative of that more curvy, voluptuous type that was definitely in vogue back in the 50's. It's hard for me to pick an absolute favourite of her roles, but "Bell, Book and Candle" is probably it, though of course she is also renowned for her role in Hitchcock's "Vertigo". 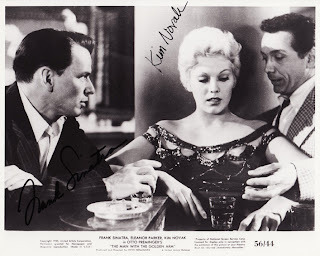 Also, being the huge Frank Sinatra fan that I am, I have a soft spot for Kim's role in "Pal Joey" too. This was their second film together, having costarred previously in "The Man With the Golden Arm". Here is an original autographed photo from my collection of Sinatra memorabilia, which is a treasured piece as you can imagine. So in closing, I would like to dedicate this post to Roy Disney, as well as to Jeremy Richey, whose "Moon in the Gutter" blog has become one of my regular daily reads! This past week at Sheridan College, two of my current 2nd Year students, Amir Avni and Mitch Kennedy, asked if I would do an on-camera demonstration of how I take a drawing from initial rough gesture through to the final sketch. It was all very spontaneous and we set up in the classroom right after I'd finished this week's lesson to their group. In a matter of minutes the camera was set up on the tripod looking down over my left shoulder and I started sketching away, keeping a stream of consciousness commentary going all the while I was working. Hopefully this will illustrate the ongoing thought process I experience as I am working out a drawing. By the way, I apologize for the initial stage where I am gesturing in quite lightly in blue pencil on the paper. What I didn't realize at the time was that it was just too light for the camera to pick up. However, once I start working out the basic forms on top of the scribbled gesture, you can make out more clearly what I am doing. As for the chosen subject matter, let's just say that there's nothing more appealing to me than doodling a cute gal! The finished sketch. By the way, if this were an actual assignment, I would lay a fresh sheet of paper on top of this and refine the drawing much more before inking it. Odds are he’ll do Larry King tomorrow. But you've still got TV! Odds are you'll do Larry King tomorrow. 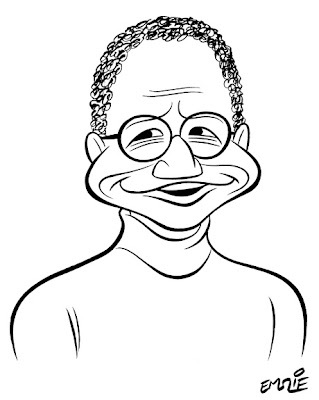 Odds are you’ll do Larry King tomorrow. Of course, Cleese has had some success in his years after Python, most notably in his own series, "Fawlty Towers". However, aside from his Monty Python films, his movie career has been spotty. His biggest starring role is undoubtedly in the excellent "A Fish Called Wanda" (which he also wrote), but another film I really liked him in is the lesser known "Clockwise". In this very British film, Cleese plays the no-nonsense headmaster of a boys' school who prides himself on his strict adherence to punctuality. Every aspect of his life is planned out to the second and he can't abide those who can't do things on time. He's delighted to find that he's been named "Headmaster of the Year", but when he sets out on his journey out of town to give his acceptance speech, one small delay leads to a constant string of other things going wrong until his life seems to be a complete disaster. 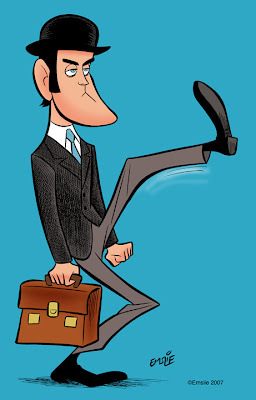 Cleese's character is similar in some ways to his Basil Fawlty in his intolerance of others' foibles, though as he loses more and more hope in getting to the conference on time he seems to grow more calmly resigned to his fate, whereas Basil would probably still be yelling and lying all the way in sheer desperation. 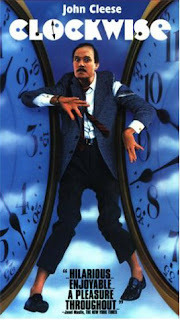 Anyway, it is certainly a film I highly recommend that shows off what John Cleese does so well. To all those who defend Flash and claim that “it’s just another tool” and can produce wonderful results in the hands of a skilled artist, I have this to say: An old Etch-a-Sketch is also “just another tool” as well, yet I could practise with it for months or years on end and never produce an image with the same control or visual appeal as I could with a pencil on paper. Like it or not, there are those of us traditionalists who see Flash for what it is: a “tool” for creating computerized cutouts using replacement parts, not fluid character animation. Even the examples being cited here as superior, such as the dancing frog short and “Foster’s Home For Imaginary Friends”, may well be entertaining but they are not in any way comparable visually to the best of traditional hand-drawn classical animation. 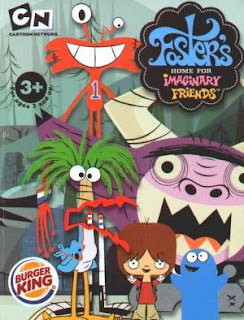 In “Fosters” for example, while I’ll grant you there may be a certain visual appeal in terms of graphic shapes, it is still just predetermined replaceable character parts being shifted around on screen. Any “Squash and Stretch” you see is not the real deal either, as it is achieved simply by distorting the image along its X or Y axis. 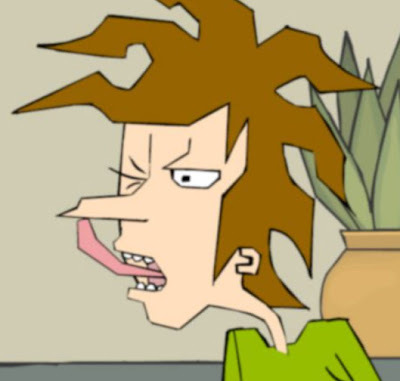 When a character on “Fosters” turns his head from the front to the side, there are no inbetweens allowing for a gradual turn, just a *whoosh* sound as the head immediately changes views in a single frame. At best, there may be an attempt at contriving a 3/4 view inbetween by sliding the features gradually along the the front face cutout before replacing it altogether with the profile. Again, the Flash software is not conducive to subtle animation. If these limitations are all perfectly fine with you folks, then go ahead and enjoy it as a medium. But please don’t try to convince the rest of us that, in the right hands, somebody could produce a film that rivals “Pinocchio” using Flash. I’ll admit, I’ve seen a precious few examples where an animator is drawing frame-by-frame directly into Flash, but even those results, while noble in the attempt, do not produce anything that has the sensitive rhythmic linework I associate with the best of pencil animation, due to the clunky line quality that I always think looks like a brush inked line that’s been hacked out on both sides with an Exacto knife! I’ve had my own brush inked line art ruined in a similar way by technicians who imported it into the “Illustrator” program, leaving it in a mangled mess, all in their quest for it to be a vectorized image. Sadly, everything has become a slave to the needs of the computer. "Foster's" - Digitally rendered, highly geometric shapes results in a deliberately flat, graphic look. There is no implied volume of form. Characters are comprised of pre-designed body pieces that are shifted around on screen and replaced by new pieces to achieve very limited animation. 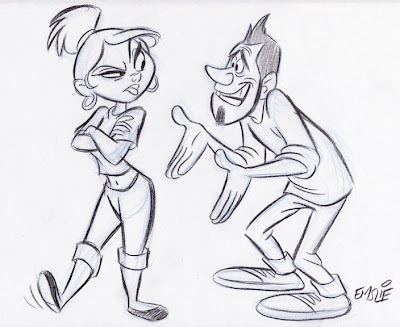 Animators are largely restricted by availability of head and body angles stored in computer. The clever timing of the movement is its saving grace. Very unsatisfying performance otherwise, due to inherent limitations of software. 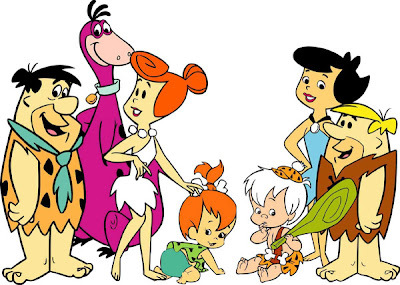 "Flintstones" - Also, limited animation with some parts of body on "held cels" that do not move while other parts, like arms, legs and face are animated with different individual drawings to achieve more characterization and distinct facial expressions. Though still shape-based design to some degree, there is an implied feeling of dimensional, organic form. 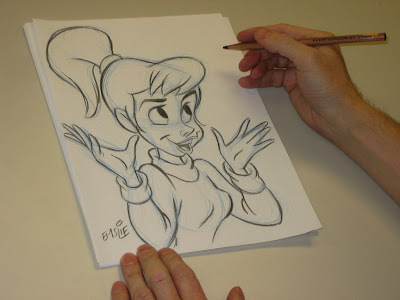 Animators still have to limit their number of drawings, but each drawing can be drawn from scratch, enabling a more satisfying performance overall, dictated by the vocal track. 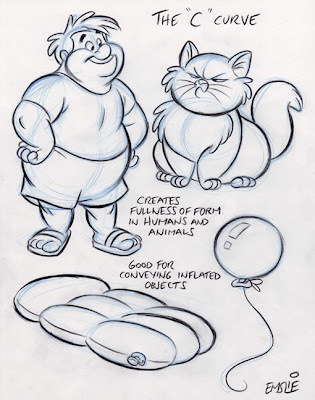 A few weeks ago, John Kricfalusi wrote a very helpful post on using simple toys as a drawing aid for learning how to construct a character using basic forms and guidelines for placing surface details. Here is the post showing his example of a Top Cat construction drawing. Although I haven't used that officially as a lesson in my own Character Design class, I have actually given something similar in past years to individual students who are having trouble getting the hang of construction drawing. 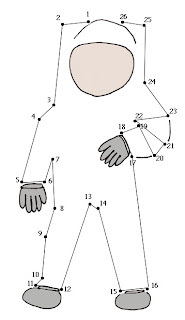 I'd hand out a sheet showing my sketches of a simple vinyl toy in several different angles. 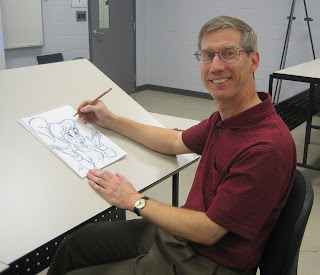 Hopefully, practicing that method of drawing on their own, the students could more quickly get up to speed with the rest of the class. Interestingly, I have often had the opportunity to do the exact reverse of that process for many jobs in the past. I used to regularly create "Turnaround Drawings" of various Disney characters for the Disney Stores and Catalogue art department. Usually an artist there would provide a rough concept sketch of the character in the desired pose and I would then adapt that sketch into a series of 2 or 3 drawings depicting the character at different angles. These turnarounds would then be sent to the artist who would then sculpt the actual item in clay using the various views as a guide to maintaining the accuracy from all sides. I always enjoyed the challenge of trying to visualize the finished sculpture as I was working out these different views. One really has to "think" in 3 dimensions. Usually, front and back 3/4 views are the best for showing the most visual information, but sometimes including an extra view or partial view is desirable to fill in some extra info, like the direct front view of Grumpy's head to show how the one eye is shut while the other is stretched wide in his skeptical expression. 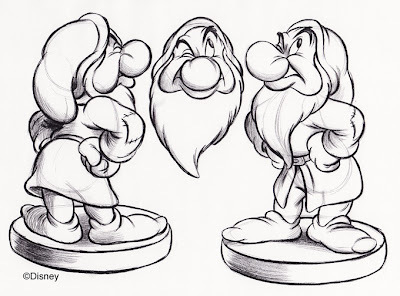 In addition to these turnarounds, the sculptor would normally receive some animation model sheet drawings that would help him further understand the character's structure. 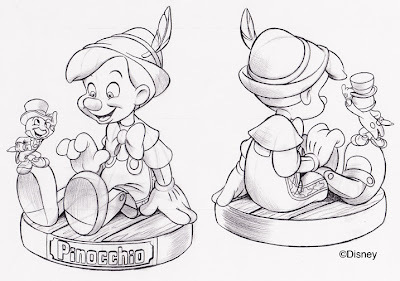 By hunting around a bit on Google, I was able to find this one image of the finished Pinocchio figurine ( a line called "Big Figs" by Disney), though the view is certainly not the best to show off the character well. After I do these things, I'm never really sure if all of them do in fact get produced. Last year, however, I did see several I had worked on when I visited the Disney gallery in Downtown Disney at WDW in Florida. It was neat to see how they'd come out. Usually I feel that the sculptor, with the Disney art department's guidance, does a very nice job in maintaining what I was trying to portray in my turnarounds. 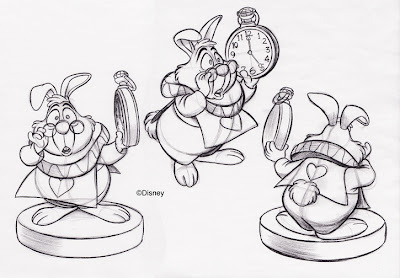 To help understand his profile, Disney had requested a third view of this White Rabbit pose. He was certainly an enjoyable figure to work on, being comprised of very rounded forms. In fact, you can see my construction lines still visible, like the round pear shape body and the small sphere for his cranium. These underlying construction lines would have been drawn in blue pencil in my original drawings, appearing as a light gray in these photocopies. Incidentally, this post today is in response to a request made several weeks ago by my friend, Alvaro Cervantes. 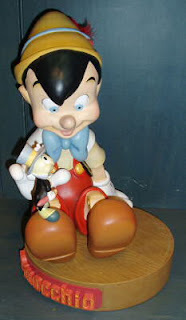 He is a brilliant sculptor himself with many years experience in toy design, both at Disney and other companies. 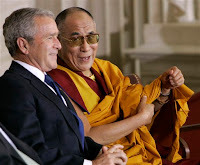 Please check out his work by clicking on the link to his blog provided on the right. Do I Love "The Jungle Book"? You Better Believe It! It seems that with the 40th Anniversary 2-disc DVD release of Walt Disney's "The Jungle Book" this past week, a lot of animation related bloggers are posting up their memories and thoughts on this animated classic. 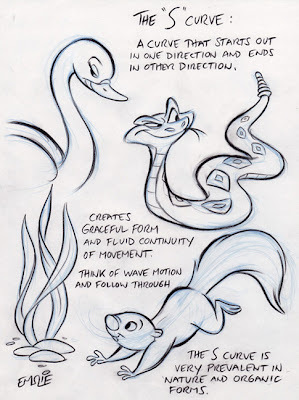 Check out Disney animator, Will Finn's post here. Since "The Jungle Book" remains my alltime favourite film of any kind since its debut in 1967, I reckon I need to add my reminiscences here too. When "The Jungle Book" premiered on the big screen way back then, I was just a seven year old kid. 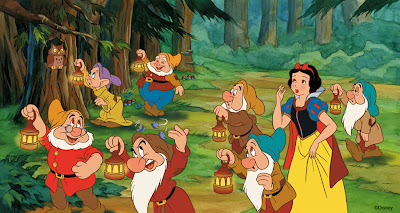 I'd already been cartooning since I was about four, mostly from watching the likes of Popeye and Bugs Bunny cartoons on TV, but I'd seen several older Disney features in their periodic rereleases and had definitely developed a taste for Disney animation. But now I was getting to see Disney's latest release as it was appearing onscreen for audiences for the first time! 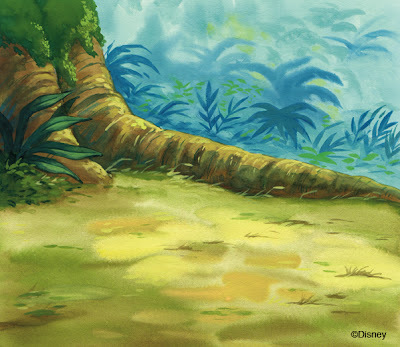 I suspect that for many of us animated cartoon fans who came along at the tail end of the Baby Boom, "The Jungle Book" was the film that really did it for us. I know I was certainly at that impressionable age where this film was like a catalyst that started me toward wanting to be a cartoonist as my life's goal. Yes, I was focused on my future career at the tender age of seven, as frivolous and risky as it may seem, and nothing or nobody was going to take me back to a more practical job in the Man Village! The pages reproduced above are from a publication called "Persistence of Vision", which was started by my friend Paul F. Anderson back about 15 years ago. In the few years it was published, there was no better, more exhaustive journal on Disney history than this one, and I hope that Paul realizes just how many people owe him a big debt of thanks for his efforts in producing such a series of wonderful issues. 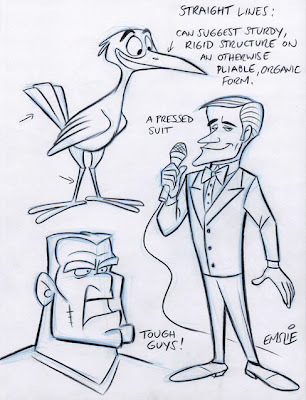 Anyway, this was an article I had written and illustrated for POV, detailing the way Disney's animators would often caricature the essential physical elements and mannerisms of the personalities who gave voice to the characters. Whereas it is quite an obvious ploy to use in a human character like, say, The Mad Hatter, basing his looks on that of comedian, Ed Wynn, it takes some clever doing to translate an actor's physical characteristics into that of an animal. I don't wish to repeat myself here, so please read the article to get a better idea of what I'm talking about. Hopefully, you can see from my caricatures how the Disney artists were similarly interpreting the actors' features into animal form. 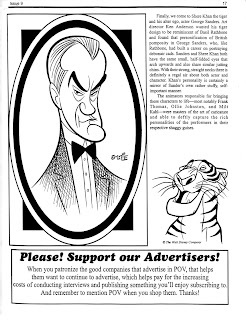 Michael Sporn has written a very good article on his take regarding Disney using celebrity voices for the characters in "The Jungle Book". I certainly don't share his opinion of the film as a whole, but I certainly understand his criticisms of the voice talents. However, I'd like to share my own thoughts on why I believe that the situation was not quite the same in that film as it is in the rampant, celebrity-driven animated features of today. Considering that "The Jungle Book" came out in 1967, I think it's fair to suggest that practically none of the principal voice actors employed were anywhere near their height of popularity when they recorded the soundtrack to the film. Phil Harris had been a popular radio personality on both his own show with wife Alice Faye, as well as previously playing the boozy, breezy buddy on Jack Benny's radio show. By the time "The Jungle Book" came his way, he'd been reduced to the occasional guest appearance on a variety or talk show and would have been virtually unknown to kids of the time. 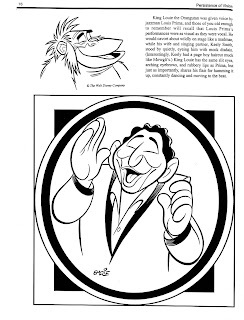 Likewise, Louis Prima was not a household name with kids either, having had his hit recording career about 10 years earlier, and even his Vegas show, which would have been geared more towards their parents, was also in its waning years by 1967. George Sanders was many years past his physical prime as a dashing leading man onscreen as either noble hero or nefarious cad, and was currently turning up as a character actor in mostly B pictures by then. Only Sebastian Cabot would have been a familiar voice to kids of that era, as he had just found fame on TV's "Family Affair" as the portly valet, Mr. French. These days, actors are hired for voicing animated characters based mostly on their recognition with contemporary audiences. So it is you get A list actors like Brad Pitt, Catherine Zeta-Jones and Michelle Pfeiffer all doing lead roles in Dreamworks "Sinbad", and Mel Gibson and Kevin Kline turning up as heroes in recent Disney features. Unfortunately, despite their considerable acting skills and marquee value, none of these actors, at least in my opinion, brought anything much to the roles in terms of vocal "personality". In other words, for all they brought to the performance, the studios could have saved themselves a lot of money and hired virtual unknowns who could give a reading at least as good as, if not better than the big name stars. Frankly, I much prefered the warm, delightful vocal performance of Jodi Benson in "The Little Mermaid", despite the fact she was a virtual unknown outside of her work on the Broadway stage. 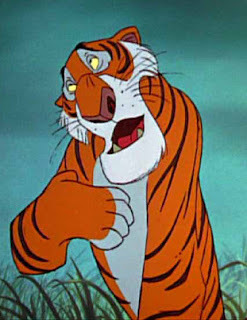 I'd argue that all of the vocal talents used in "The Jungle Book" were hired more for the strength of their distinctive and charismatic vocal quality far more so than for marquee recognition. 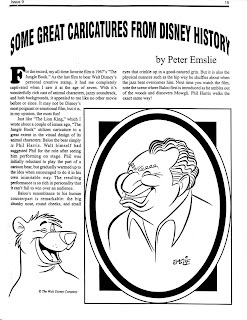 As a kid back then, I related to Baloo the bear because of the warm, rumbling voice of Phil Harris. To this seven year old kid, Harris brought a vocal quality and mannerisms to the role that resulted in pure cartoon magic when coupled with the equally appealing visuals provided by animators, Ollie Johnston and Frank Thomas. 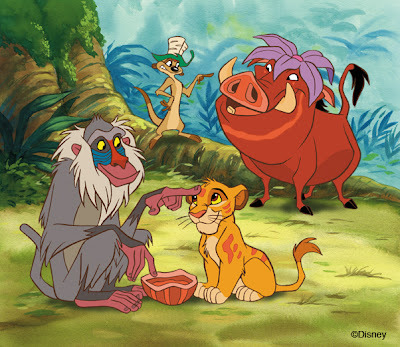 I didn't know who most of the voices belonged to at that time, but all of these characters were brought to life for me in a way that made "The Jungle Book" my favourite film back then and continues to be to this day! This is Lana, another one of our regular models at VAB. Lana has the pixieish quality that I just love to draw. Her sparkling blue eyes slant upwards slightly giving her that cute impish look, and when she smiles she has one deep dimple on her right side. Lana is probably the one model I am almost always able to successfully capture the likeness of in most of my sketches because of her distinct features. Here is a very traditional portrait I drew during a longer 30 minute session. I'm quite pleased with the likeness in this one. 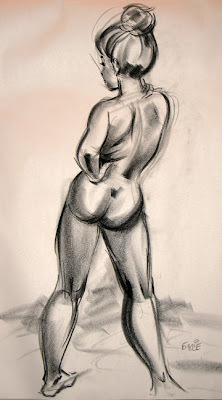 This is a looser treatment, as it was sketched in a 10 minute pose. Again, I think the likeness is pretty good here and the drawing feels spontaneous and fresh. Just like Heather, Lana also has musical theatre training and a dance background. So she also gives us poses that show great rhythm and graceful form. Some of her quick gesture poses can get pretty acrobatic too, as you can see by that top one in the middle. I believe that a really good model has to have some artistic sensibilities in order to assume poses that create visual interest for those sketching her. An arch to the back, a twist to the torso, and a rhythmic arrangement of arms and legs are some of the elements that I think constitute an inspiring quick pose. As musical performers used to being onstage, both Lana and Heather understand this and are very self aware of how their poses will read to the audience. Of course, more sedate poses are quite acceptable for the longer studies, as it's hard for the model to hold a complex pose for too long. Here are several drawings in my caricatured approach. In this first one I added the microphone to the drawing because Lana is also a very accomplished singer. I may have made her a bit too leggy in this pic though! Both of these final two drawings are the type I usually like to do in my caricature style. I find a medium close-up very satisfying to draw, as I can get some body language while also concentrating on getting a likeness of the model's face. Lana has such well-defined and appealing facial features that I can't help but want to capture as close a likeness as I can achieve. 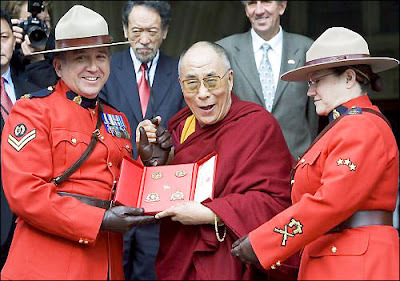 This last one in particular is a favourite of mine. I really think I caught something special in her expression and eye direction. This is one I'm tempted to frame up some day. Anyway, these are just a few of my sketches of Lana, and I'll be putting up more periodically. These TV specials were a collection of fun musical vignettes that showcased Brigitte Bardot's talents as a French pop singer. I probably know her better in this capacity than I know her as a film star, admittedly having only seen a handful of her films. The early 60's was a great time for French pop music, as there were also cute singers like Francoise Hardy and France Gall on the music scene back then, both of whose CDs I listen to in addition to Brigitte's. 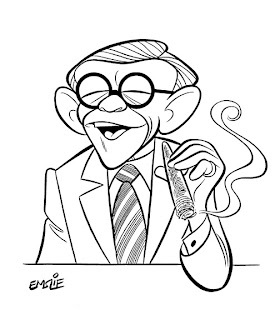 In fact, I highly recommend checking out Katie Rice's blog to see her sketches of those singers. Katie is such a talented young cartoonist and I love to see the way she approaches caricature. I'm hoping she'll also try her hand at drawing Brigitte! Like I said, I haven't seen many of Brigitte Bardot's films. I have seen her big breakout role in "And God Created Woman", where she plays a gorgeous, saucy young ne'er-do-well who seems cursed to inspire mad desire in every man she encounters in St. Tropez. I also enjoyed her in "Viva Maria", which has an almost cartoonish flair for slapstick visual humour. However, I think my favourite Bardot film is one that I caught at Toronto's Cinematheque several years ago, called "The Truth", in which she plays a young woman on trial for the murder of her lover. It's quite compelling and Brigitte gives a magnificent performance. Alas, I must admit I've never seen "Contempt". Anyway, I really think I need to see more of her work so that I can fully appreciate her as an actress in addition to my fondness for her as a pop singer. So in closing, may I say, Bon Anniversaire Brigitte! Again, I opted for the slightly caricatured approach, as my three 10 minute more traditional sketches right before these were somewhat disappointing, seeming too stiff for my liking. Once I allow my cartoonist instincts to take hold, I tend to loosen up and produce more appealing results. By the way, these are just to whet your appetite for the pics of another model I'll be showcasing a few days from now! A teen boy shows up late for a date with his girlfriend. I tell them that I want to see an emphasis on good clear poses stressing line of action that would also read well in silhouette. I want them to devise entertaining expressions and body language that show what the characters are feeling, all of which should result in a clear visual statement in a single drawing that communicates to the viewer what's going on in the scene. And they have about 20 - 25 minutes to do it before I collect them up and then show them all on the overhead projector in a quick, lighthearted critique. In this first sketch, the girl is looking quite defiant with arms folded and back turned on her hapless boyfriend who's trying desperately to plead his case. I like her withering glare! 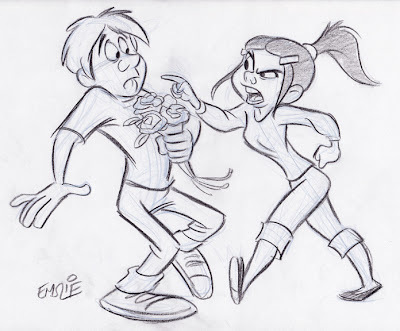 In this second variation, the girl has taken a more aggressive stance, moving toward the poor guy who's backing away as she's really ripping into him. In both drawings, I also took a number of quick glances toward my students who were busily producing their own variations, taking note of clothing, hairstyles and facial types that I could incorporate into my sketches. This is something I explained to them afterward, suggesting that they too should develop the good habit of taking visual notes in their sketchbooks on all that they see around them. Building up a reference library of character types, face shapes, fashion, etc, etc., will always result in much richer character designs in future assignments!